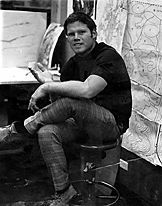 Hal in his first Landscape Architecture graduate design studio, after earning his BLA at the University of Florida. Born in 1944, Hal Stowers, is a link between Old Florida and New Florida. Hal grew up in a small log cabin in the woods of Safety Harbor, Florida. He still lives in the same county, but Pinellas is now the most densely populated, per square mile, county in the state of Florida. 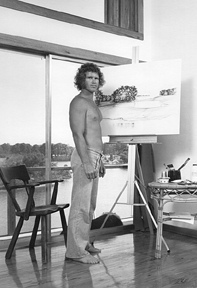 Across the tidal flats and bay from his studio/residence, which is tucked away on a mangrove rimmed bayou, are barrier islands with sugar white beaches, sea oats, sand dunes, palm groves and mangrove forests. Standing on one of these jewel-like islands, one can see to the west, the open horizon, so dominant in Hal's art. To the east and far south is almost continuous development including some areas of wall to wall high rise buildings. All but a few of the high rises have been built since Hal's childhood. It is this environment, juxtaposing pristine natural areas and open water, with dense development, which has given rise to this artist and his art. Hal spent summers of his teenage years on Clearwater Beach, renting out surfboards he owned ... and watching, day after day, the dazzling coming and going of sky, sand and sea. He rode to the island everyday on his Harley, barefoot, in a bathing suit. A nature freak who always felt he would be a creative person, he chose to study landscape architecture and on a larger scale, regional design and planning. Professor Herrick Smith, Chairman, Department of Landscape Architecture, at the University of Florida, was one of Hal’s early mentors. 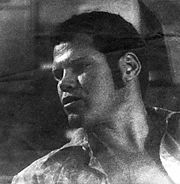 Graduate school at Berkeley, during the height of the "People's Park" and "Haight/Ashbury" era of 1967-69, served as "future shock," for this small town, Florida boy. 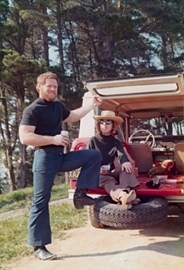 Although Hal never really liked being a student, he respected and loved the interface with his active and cutting edge Berkeley professors including Garrett Eckbo, then Chairman of the Department of Landscape Architecture, College of Environmental Design, Donald Appleyard and the late J.B. Jackson . He delighted in talking landscapes, life and motorcycles with J.B. Jackson, and in having the opportunity to ride the "touring" professor's BMW around the Berkeley hills. He elected to round out his studies by enrolling in a course with noted sculptor Pomodoro. Leaving Berkeley, he carried with him a wax positive which later was cast in bronze. Returning to his home area on the Gulf of Mexico, he accepted a position with the Tampa Bay Regional Planning Council and was soon promoted to Chief of Planning. He authored and illustrated a hand book entitled REGIONAL DESIGN GUIDE. The publication won a national award. After only eighteen months, he left the TBRPC, and began painting canvases of pristine natural areas that were fast becoming bulldozed and developed. Since then, Stowers canvases, watercolors, monotypes, mixed media, sculpture, limited edition original lithographs, etching/aquatints, photogravures and digital works have been shared with the public in group showings and more than twenty one-person exhibitions. His art has been avidly collected by hundreds of corporate and private collectors. LITTLE PALM ISLAND, FLORIDA KEYS - Under the coconut palms and "starry starry night," B.J. and Hal celebrate the 25th anniversary of first solo exhibition of environmental art, and their 30th wedding anniversary, 1996. Throughout the years, recognition for Hal Stowers' art and environmental efforts has come from important and diverse entities. The thread they share is an increasing awareness and concern for the quality of our environment and what we are leaving for future generations. Hal Stowers was proclaimed a "Natural Treasure," by Tampa Bay Area's Pinellas County, Florida, as part of the county's 75th Diamond Jubilee Celebration in 1987. He was asked to create the Official Commemorative of this year-long celebration. 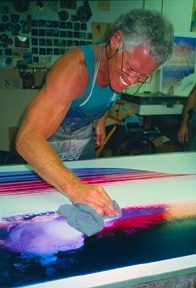 During the 1993 Legislative Session, Secretary of State Jim Smith and the Florida Department of State, Division of Cultural Affairs presented a three month long, major retrospective one-person exhibition, in the twenty-second floor Capitol Gallery, entitled "HAL STOWERS, WORLD ENVIRONMENTAL ART. 'THE GULF TO THE CARIBBEAN.' " The exhibition commemorated "The Year of the Gulf of Mexico," a program to protect and restore the Gulf environment, involving states bordering the Gulf. The Department of Landscape Architecture, College of Architecture, University of Florida, recognized Hal Stowers as "Distinguished Landscape Architecture Alumnus 1993." Professor Emeritus and past Chairman of the Department, Herrick H. Smith, says of his former student, "He turned from one form of landscape architecture to another; from an administrative, planning context to an illustrative and communicative context that is still landscape architecture ... Landscape architecture is an interesting blend of science and art and has a strong social context -- now he explores that and everything else as a painter." In 1995, Hal Stowers was elected a Full Member of the American Society of Landscape Architects. The Florida Association of Realtors has sponsored an ongoing exhibition, since 1991, at their state headquarters in Orlando entitled, "HAL STOWERS, WORLD ENVIRONMENTAL ART - 'FLORIDA, TWO DECADES.'" In 1997 the organization acquired the works in the exhibit as its permanent collection. For more of the story see "ARTIST - WALKING TREE WHISPERS" and "ADVENTURES"